Grand Excursion Preview  Buffalo City, Wis., to Wabasha, Minn.
Buffalo City, Wis., to Wabasha, Minn. The Mississippi opens into a broad valley above Lock and Dam 5. Minneiska, Minn., (pop. 116) stretches out along a terrace above Highway 61 where the Main Channel takes a tight jog against the Minnesota shore. Bucks Bar, on the southeast end of town, is a mandatory stop for motorcyclists on the Flood Run in the spring and hunters in the fall. Just upstream, Weaver Bottoms once was a paradise for waterfowl and waterfowl hunters, when the shallow backwater was filled with arrowhead and other aquatic plants. The plants and waterfowl all but disappeared by the late 1980s. In an attempt to save the bottoms, the Army Corps of Engineers, U.S. Fish and Wildlife Service and the Minnesota Department of Natural Resources built two narrow and curvaceous islands in the bottoms. Though Swan and Mallard islands did not bring back the swans and mallards, the Corps and wildlife managers learned from the experience and have built many, more successful islands since. to help restore the damaged habitat there. On the other side of the river, Buffalo City, Wis., (pop. 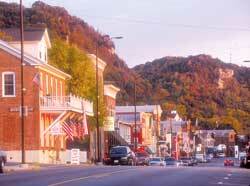 1,040) is one of the few towns on the Upper Mississippi that does not have a railroad track between it and the river. This quiet river town is also nearly a mile off the highway. About six miles upstream, Alma (pop. 942) clings to the bottom of a steep bluff along the river. The county seat for Buffalo County, Alma was settled by Swiss immigrants and rough log-rafting crews. Lock and Dam 4 operates right in the middle of town. Take the walkway over the railroad tracks to the observation platform where you can watch boats lock through. At the north end of town Riecks Lake used to attracts thousands of tundra swans and swan watchers every fall. However, the lake, which is at the end of the Buffalo River, is silting in, and fewer swans stop there. 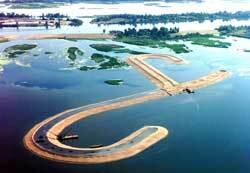 A dredging project should restore the lake soon. Just upstream from Riecks Lake, Beef Slough played a central role in the log rafting era. This 12-mile-long channel along the Wisconsin shore was the busiest raft staging area on the river. Tens of thousands of logs that floated down the Chippewa River from northern Wisconsin were built into huge rafts and floated to sawmills downstream. On the Minnesota side of the river, the sandy area upstream from Weaver Bottoms is called, appropriately, Weaver Dunes. Public lands and Nature Conservancy lands there provide a home to Blandings turtles, which are on the threatened list in Minnesota, Wisconsin and Illinois. The Zumbro River divides this broad area of dunes, wetlands and farm fields. The Zumbro once meandered through the wetlands and entered the Mississippi farther north, near Wabasha, until it was straightened and diked to its current path. Kellogg (pop. 430) sits just south of the Zumbro. The area north of the Zumbro is pretty busy during the summer, with a campground and homes along Peterson Lake and Teepeeota Point. A small parking lot provides access to the dike for Lock and Dam 4, where anglers head for the Finger Lakes. Upriver a bit, Wabasha (pop. 2,599) is one of the of Minnesotas oldest cities. It sits between the railroad tracks and the river, but it is busier than Buffalo City because it is a county seat and holds on to one end of a bridge across the Mississippi. Wabasha has earned a reputation as a great place to watch eagles and is home to the National Eagle Center and eagle-watching festivals. It also served as the location for two films starring Jack Lemmon and Walter Matthau: Grumpy Old Men (probably the only film to mix romance and ice fishing) and Grumpier Old Men, though the films were not actually shot there. The Grumpy Old Men Festival celebrates the movie and ice fishing every winter. On the other side of the bridge to Nelson, Wis. (pop. 395), the highway cuts across the lower end of the delta of the Chippewa River, a maze of backwaters and home to a few massasauga rattlesnakes. This shy snake, also called swamp rattler, is endangered in Wisconsin and on the endangered or threatened list in nearly all of its range.